Batiks Galore is going out of business and everything is 60% off (in store only & one yard cut minimum). Our last day of business is Saturday March 2nd. 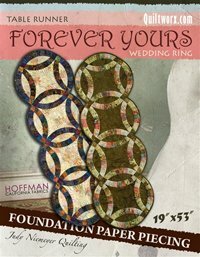 A collection of fabrics designed by Hoffman Fabrics of California were used to make the samples shown on the cover page. A strip piecing technique with foundation paper piecing is used to complete the arcs for the table runner. Curved piecing and traditional piecing skills are required to join the units after the foundation piecing is completed. Finished Size: 19" x 53"